La Ciaccia: Especially suitable for families with children or couples. Very quiet, very little traffic. Excellent restaurants and pizza at affordable prices. Farm with traditional menus. Parking nearby beaches unpaid. Beaches almost all free, with small parts and sunbeds for hire at € 10/15 per day. Maragnani the beach about 900 meters from the house is spectacular backdrops rather low, also suitable for children. It is free but with the rescue service. In the evenings during July and August markets stalls with typical bi-weekly and evening entertainment, baby, dance and group dance organized by country. Shuttle service to the surrounding villages throughout the summer at a cost of 1.50 € per day. Bus service from Alghero airport € 10 each way. First-aid station 2 km, pharmacy, bank, 2 km. Beaches: La Ciaccia 200 mt. The beach of La Ciaccia has a rocky and sandy area with a relatively low background, bar, restaurant and beach facilities, which occupy a small stretch of beach nearby the following beaches:. Maragnani about 900 meters wide with parking and drop-down wooden stairs spectacular;. San Pietro a Mare, a 2 minute drive to the beach in bathing facilities, a bar, a scenic river behind the beach, canoes, etc.. Badesi reached 7 / 8 minutes by car beach long white sea, beach and bar some services but given the length of the beach is mostly free;. Isola Rossa reached within 15-20 minutes drive to the tranquil and beautiful beach of the village and the fabulous beach Marinedda;. Costa Paradiso reached in 20 minutes by car panoramas;. beaches of northern Sardinia by Vignola in Santa Teresa di Gallura 50 minutes max. Stintino 50 minutes. Restaurants: La Ciaccia is a pizzeria / restaurant for families to 30 meters from the house with good prices and good pizza. Also in La Ciaccia right by the sea 300 meters from the house is 'La Locanda del Mare' excellent seafood restaurant and a beautiful location. A Castelsardo about 7 km there are many restaurants including the famous and historic Cormorano, the Baga Baga and the new complex with the restaurant The glamorous BajaLoglia Incantu. Within 2-3 km of several farms with traditional menus. Bathroom tiles Cerasarda white and blue decor shells, shower, wall hung and window. Die Wohnung entsprach voll der Voranzeige, sie war sauber und gemütlich eingerichtet. WiFi OK, nah zum Einkaufen, nah zum Restaurant, nah zum schönen Strand. vielen Dank Karl, ich bin froh, dass es dir gefallen hat. Nette kleine Ferienwohnung unweit vom Strand. Unkomplizierter, freundlicher Kontakt mit der Vermieterin und auch vor Ort mit Liberty. There are all of you need and more ! Many thanks to mrs Liberty !!! It is really wonderful house ! I HOPE, I'll COME BACK ! Thank you Oleg, a warm greetings from Liberty and me. Waren vom 11.06 bis 29.07.2017 in La Ciaccia;nette Ortschaft und zu dem Zeitpunkt sehr ruhig.Die Ferienwohnung ist genau so wie beschrieben und sehr sauber,da die Eigentümerin eine "Perle" (Miss Liberty) hat die sich um die Wohnung und den Belangen der Gäste kümmert.Das Restaurant "La Ciaccia" kann ich nur empfehlen. Sardinia fantastic especially in less crowded periods. Beautiful apartment, where to find everything that can be useful without regret their home (looks like a decorated by architect !). A few metres from the sea, and near essential service (supermarket, butcher, restaurant etc..), excellent quality/price ratio, a pleasant and wonderful discovery in a quiet and quality. Breakfest definitely... I hope very very soon!!! 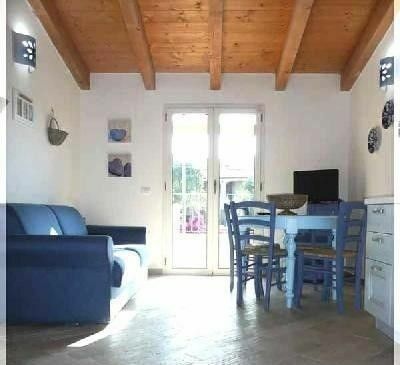 Thank you very much.I will always be honored to welcome you as a guest to the "Casa Blu"
The residence is located in La Ciaccia all small tourist village on the sea that lies between Castelsardo (7 km) and Ile Rousse (15 km). La Ciaccia has a supermarket (30 meters from the house), restaurant / pizzeria (30 meters from the house), church, newspaper / tobacco, ice cream, bakery, pastry shop all within a maximum of 200 meters from the house. The distance from the sea visible from the terrace of stay is 70 meters (cliff) and the first of about 300 meters down to the sea with sandy beach and charming restaurant 'pieds dans l'eau'. It is recommended for travel by car as the area is rich in beautiful beaches and places to visit but if you want you can also do everything on foot with comfort. The nearest pharmacy and medical service in Valledoria is about 2 km. Present children's playground and beach service only a short distance, the rest is free beach but with vigilance and rescue, parking free. ALL INCLUSIVE: Consumi: acqua, luce, gas, aria condizionata, pulizie finali, wifi compresi.